Politico recently published an article I wrote called "The Experience Fallacy," which was an attempt to show, through the historical record of our past presidents, that political experience is not an indicator of quality in a would-be-president. Given that one of the main thrusts of the anti-Obama campaign is his lack of political experience (this is an important distinction, as you will see), with some charging that he is the most inexperienced person to ever even run for president in the "modern era' (whatever that means), it seems highly important and relevant to look more closely at the relationship between political experience and presidential leadership -- which of course means that no one has done it. As I wrote in the "Experience Fallacy," using an impartial ranking of quality is important here to avoid bias, so I based my analysis on the 2000 Wall St. Journal poll of historians, which touted its composition of "liberal" and "conservative" historians. This is not how I would rank our presidents, but that is not the point. What jumps out, beyond that having more political experience is not an indicator of a better president, is that the top tier of experienced presidents are mediocre to bad, with the exception of Jefferson, a Founding Father. In fact, the sweet spot appears to be in the 10 to 21 range, which includes six of the top ten presidents. It also seems important to have some political experience, as the three generals are only saved by Eisenhower, and it certainly is a mixed bag below the ten-year level. 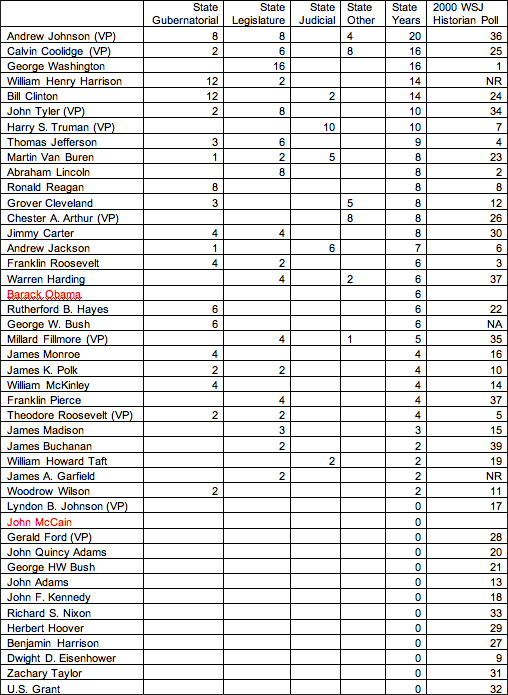 Again, large amounts of federal political experience do not seem to be a good thing (except for Jefferson). The sweet spot here is again lower down the experience ladder: six of the top ten had between 1 and 11 years of experience, although really having more than six starts to get risky. It is also clear that it is a risk to have no federal political experience (think about the beginning of Bill Clinton's term as he struggled to work in the federal bureaucracy). Finally an area where it does seem to pay to have more political experience, although the absolute upper end again is not a good indicator of success. But eight of the top ten Presidents have between four and ten years of state experience, and the large group with no state experience is for the most part not great company for a presidential candidate to be in. It is also important to note another fallacy: that state executive experience is more important than state legislative experience. It's easy to see where this comes from, it makes sense to think that a former governor will be better equipped to be president. But it is not borne out by the facts. Putting all of this together, here is the best combination of political experience: between one and six years of federal experience, and four to ten years of state experience, for a total of less than 22 years of total political experience. Barack Obama has four years of federal experience and six years of state experience for a total of ten. He is in the best areas in all three categories. John McCain has 26 years of federal experience and zero years of state experience for a total of 26. He is in dangerous areas in all three categories. It is extremely important to place all of this in the proper context. This emphatically does not mean that Obama will be a good president and McCain will not. What it does mean is that the whole experience argument is a complete crock. Levels of political experience do not equate to presidential success. 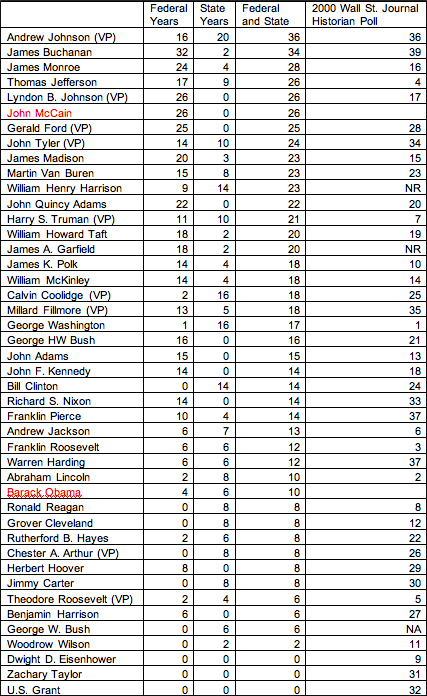 Great presidents have had little to no political experience (much less than Obama has). Great presidents have had much more political experience than Obama and close to the amount McCain has, well, just Jefferson, but there still is a historical precedent. Terrible presidents have had very similar levels of political experience to Obama and terrible presidents have had very similar levels of political experience to McCain. A few counter-arguments to the counter-arguments. Yes we are completely ignoring non-political experience. Dwight Eisenhower was the Supreme Allied commander in World War II. Woodrow Wilson was the head of Princeton. Teddy Roosevelt was a rough-rider. Ronald Reagan was an actor. All experiences that had valuable impacts on their presidencies. But this is not an attempt to show what the perfect personal biography is to make a great president. The charges against Barack Obama are not that he lacks the personal, non-political experience, to be a good president (far from it). The specific charge is that he lacks the political experience and the evidence shows that not only is that completely false (same as Lincoln, more than Reagan, Teddy Roosevelt, Wilson, and Eisenhower), but also irrelevant. Another complaint might be that comparing eras is impossible because we face "more difficult" times now. This particular form of self-importance is probably prevalent throughout history, but it doesn't make it more right. Tougher than building a new country from scratch, with war with Great Britain and France, revolutions, and civil war a constant threat? Tougher than trying to hold the country together in the build-up to the Civil War and the actual event itself? Tougher than putting the country back together after the bloodiest war in the nation's history? Tougher than fighting two world wars and the Great Depression? Tougher than the Cold War and the threat of Mutually Assured Destruction? Is the job more complicated now than in previous eras? Undoubtedly. Does this mean we can't "trust" someone with less experience to do it? There is less data to go on here, but given that the "modern presidency" certainly existed when Reagan (who ranks #8 in the Wall Street Journal Poll) was president, it seems the answer is yes. The historical facts will certainly not change the media narrative or the minds of many Americans. The Experience Fallacy is too deep-rooted to be confronted that easily. But we need to start attacking these false arguments head-on, and who knows, maybe some actual facts will seep through.